Changes in an updated program could be difficult for the practitioners like teachers. and implications for learning centers and for further research were determined. Allen, D. & Fraser, B. (2007). Parent and student perceptions of classroom learning environment and its association with student outcomes. Learning Environment Research, 10, 67-82..
Aydın, A. (2010). Okul Öncesi Öğretmenlerini Okul Öncesi Eğitim Programına Yönelik Değerlendirmeleri, Kafkas Üni. SBE, Eğitim Bilimleri Ana Bilim Dalı, Eğitim Programları ve Öğretim Bilim Dalı, Yayınlanmamış Yüksek Lisans Tezi. Ayvacı, H.Ş., Y. Devecioğlu & Yiğit N. (2003). Okulöncesi öğretmenlerinin fen ve doğa etkinliklerindeki yeterliliklerinin belirlenmesi Erişim Tarihi: 2014 Nisan http://www.fedu.metu.edu.tr/ufbmek-5/b_kitabi/PDF/OgretmenYetistirme/Bildiri/t277d.pdf. Backman, Y., Alerby, E., Bergmark, U., Gardelli, Å., Hertting, K., Kostenius, C. & Öhrling, K. (2012). Improving the School Environment From a Student Perspective: Tension and Opportunities, Education Inquiry 3 (1), 19-35. Davies, D.; Jindal-Snape, D.; Collier, C.; Digby, R.; Hay, P.; Howe, A. (2013). Creative Learning Environments in Education- A Systematic Literature Review. Thinking Skills and Creativity, 8, 80-91. Durmuşoğlu, M.C. (2008). An Examination of the Opinions of Preschool Teachers about Preschool Learning Settings in their Schools, Eurasian Journal of Educational Research, 32, 39-44. Dyment, J; O’Connell, T.S. (2013). The Impact of playground design on play choices and behaviors of preschool children. Children’s Geographies, 11 (3), 263-280. Finn, J. D. & Pannozzo, G.M. (2004). Classroom Organization an Student Behavior in Kindergarten. The Journal of Educational Research, 98 (2),79-91. Li, Y.L. (2006). Classroom organization: Understanding the context in which children are expected to learn. Early Childhood Education Journal, 34 (1), 37-43. Petrakos, H., Howe, N. (1996). The influence of the physical design of the dramatic play on children’s play. Early Childhood Research Quarterly, 11, 63-77. Prescott, E., 1987, The Environment as Organizer of Intent in Child-Care Settings, In C. S.
Robinson, E. & Fraser, B.J. (2013). Kindergarten Students’ and Parents’ Perceptions of Science Classroom Environments: Achievment and Attitudes. Learning Environment Research, 16, 151-167. Sak R. (2013). Turkish preschool teachers' beliefs and practices related to child-centered education, METU SBE Okul Öncesi Prg. Yayınlanmamış Doktora Tezi, Ankara. Vechi, V. (2010). Art and Creativity in Reggio Emilia: Exploring the Role and Potential of Ateliers in Early Childhood Education. Routledge. Weinstein, C.S. & David, T.G., 1987, Spaces for Children: The Built Environment and Child Development, Plenum Press, New York. ISNAD ÇELEBİ ÖNCÜ, Elif . "Okul Öncesi Çocuklarının Sınıflarında Yapılandırdıkları Öğrenme Merkezlerinin İncelenmesi". 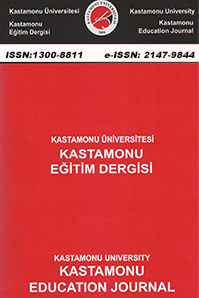 Kastamonu Eğitim Dergisi 25 / 2 (March 2017): 733-746.